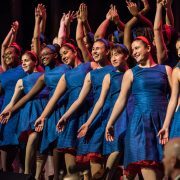 Choristers from the Young People’s Chorus of New York City will be joined by young singers from 15 other youth choruses from China, Finland, Ireland, and six U.S. states for a DCINY 10th anniversary concert at Carnegie Hall. The concert will be highlighted by world premiere works composed and conducted by Francisco J. Núñez, artistic director/founder of the Young People’s Chorus of New York City, and Venezuelan composer/conductor Cristian Grases. Young People’s Chorus of New York City and Yale Choral Artists come together on Monday, June 18 at 7:30 p.m. for a compelling concert at Kaufman Music Center's Merkin Concert Hall. 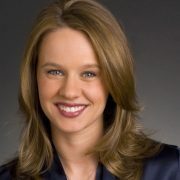 The program is highlighted by the world premiere of Borderless, a YPC commission from six-time, Grammy-winning Latin jazz composer Arturo O’Farrill featuring the Haven String Quartet, and New York premiere of The Glass Box, a YPC-Yale Choral Artists co-commission from the visionary composer/impresario Paola Prestini and Pulitzer Prize-winning librettist Royce Vavrek, set to dramatic visuals by Kevork Mourad. 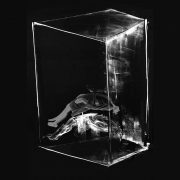 YPC and Yale Choral Artists perform the world premiere of The Glass Box on Saturday, June 16 in New Haven, CT. This concert is part of the Yale International Choral Festival, within the International Festival of Arts & Ideas. 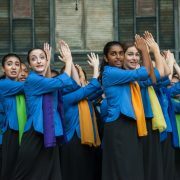 In an extraordinarily memorable 30th anniversary event, the Young People’s Chorus of New York City will celebrate the coming of summer with its debut in The Cathedral of St. John the Divine. 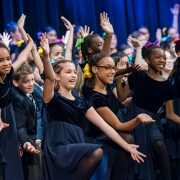 For more than 425 YPC singers, the largest cathedral in the world will provide a spectacular setting for a program of music and exciting choreography that spans the musical gamut—from the most challenging commissioned compositions to music from the Broadway, spiritual, folk, and popular genres. 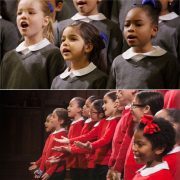 Join YPC’s community choruses—YPC at Washington Heights conducted by Maria C. Pena and YPC at Goddard Riverside conducted by Amber Salladin— at the Church of the Intercession in Manhattan for this delightful “Sounds of Spring” performance. Donations will be accepted at the door. 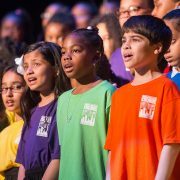 YPC presents its 15th Annual School Choruses Concert on Thursday, May 17, in Harlem’s world-renowned Apollo Theater. 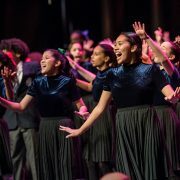 More than 1,000 children from the New York City schools in YPC’s School Choruses program join with special guests in a vibrant concert that combines song, dance and stories from many of the cultures that embrace the New York City. 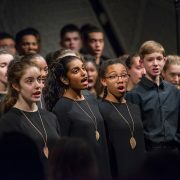 Young People's Chorus of New York City conducted by Artistic Director Francisco Nunez performs "An Afternoon of Choral Artistry," presented by Shandelee Music Festival in collaboration with Bethel Woods Center for the Arts. On its first tour of the year, a treble chorus of 42 Young People’s Chorus of New York City singers, conducted by YPC Associate Artistic Director Elizabeth Núñez – a Lee University Distinguished Alumni Awardee - will make its Tennessee debut at Lee University’s Pangle Hall on Friday, April 13 at 7:30 p.m. in a distinctive, two-hour YPC program of music and show-stopping choreography that has won YPC renown on four continents.